A pensioner who distinguished himself for his services to young people undergoing drug treatment as well as their families has received the Elderly of the Year Award from President Eddie Fenech Adami. Ronnie Micallef, 69, has a history of helping others and for the past 20 years he has helped sick pilgrims, spending a month every year in Lourdes. More recently, as a Caritas volunteer, he started counselling parents whose children are receiving drug rehabilitation assistance at San Blas. He also gives a similar service at the Millennium Chapel in Paceville. Every fortnight he leads a prayer group at the SATU facility for young drug addicts at the prisons, and he has often employed and followed the progress of young people who would have completed a drug rehabilitation programme. 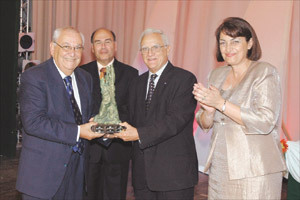 The Elderly of the Year award drew 27 nominations, with the winner selected by a board headed by Josephine Saliba. The OAA of Malta heartily congratulates Ronnie for this well-deserved achievement. For the record it has to be said that Ronnie is one of the regulars who take part in the 8th December Annual Reunions.